This book describes advanced research results on Modeling and Control designs for Fuel Cells and their hybrid energy systems. Filled with simulation examples and test results, it provides detailed discussions on Fuel Cell Modeling, Analysis, and Nonlinear control. Beginning with an introduction to Fuel Cells and Fuel Cell Power Systems, as well as the fundamentals of Fuel Cell Systems and their components, it then presents the Linear and Nonlinear modeling of Fuel Cell Dynamics. Typical approaches of Linear and Nonlinear Modeling and Control Design methods for Fuel Cells are also discussed. 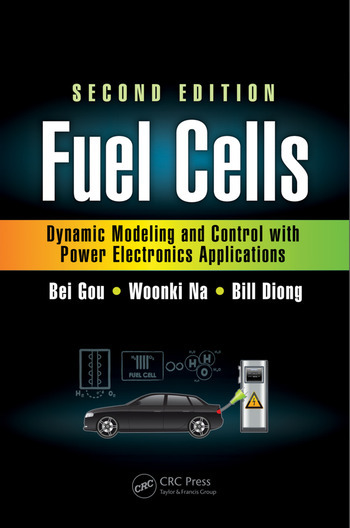 The authors explore the Simulink implementation of Fuel Cells, including the modeling of PEM Fuel Cells and Control Designs. They cover the applications of Fuel cells in vehicles, utility power systems, and stand-alone systems, which integrate Fuel Cells, Wind Power, and Solar Power. Mathematical preliminaries on Linear and Nonlinear Control are provided in an appendix. Bei Gou earned his PhD in electrical engineering at Texas A&M University in 2000. He was a power application engineer with ABB System Control at Santa Clara, California from 2000 to 2002, and then he worked as a senior analyst at the Independent System Operator-New England (ISO-NE) from 2002 to 2003. Dr. Gou joined the Department of Electrical Engineering at The University of Texas at Arlington as an assistant professor from 2003 to 2008. He is the founder of a start-up company—Smart Electric Grid, LLC. He was with the Department of Electrical and Computer Engineering as an associate professor at North Dakota State University from 2011 to 2013. His current research areas include: power system real-time monitoring, nonlinear control of fuel cells, power electronics theory and applications, blackout and cascading failures of power systems, phasor measurements, state estimation for power systems, and power system reliability. Dr. Gou has published about 90 journal and conference papers. He has authored two books, Fuel Cells: Modeling, Control and Applications (Taylor & Francis/CRC Press, Boca Raton, Florida, 2009) and Monitoring and Optimization of Power Transmission and Distribution Systems (VDM Publishing House Ltd., Germany, 2009). Bill Diong is an associate professor in the Department of Electrical Engineering at Kennesaw State University (KSU), and he is also the coordinator of its MS Applied Engineering—Electrical concentration program. He earned his PhD in electrical engineering from the University of Illinois (Urbana-Champaign) in 1992 and gained valuable practical experience as a senior research engineer with Sundstrand Aerospace (now part of UTC [United Technologies Corporation] Aerospace Systems) before returning to academia. Prior to joining KSU in 2011, he had been an assistant professor at the University of Texas at El Paso where he was the Forrest and Henrietta Lewis professor of electrical engineering between 2000 and 2002. His research interests encompass advanced power and energy systems, including: electric vehicles and electronic power converters, and other dynamic systems and their control. He has authored or coauthored more than a dozen journal publications and several dozen conference publications in these areas. Funding for his work has come from various organizations that include the National Science Foundation, the Ballistic Missile Defense Organization, and the U.S. Air Force. He is a senior member of the IEEE. Woonki Na earned BS and MS degrees in electrical engineering from Kwangwoon University, Seoul, South Korea, in 1995 and 1997, respectively. He then earned his PhD in electrical engineering from the University of Texas at Arlington in May 2008. From 2008 to 2009, he worked with Caterpillar Inc., Peoria, Illinois and participated in several hybrid electric drives programs as senior engineer. He was an assistant professor with the Department of Electrical and Computer Engineering, Bradley University, Peoria, Illinois from 2010 to 2013. Currently he is an assistant professor with the Department of Electrical and Computer Engineering, California State University, Fresno since August 2013. His research and teaching interests include: power electronics, battery management, and digital signal processor (DSP)-based control designs for hybrid electric vehicles and renewable/alternative energy applications.